Pizza: Up the nutritional content of your pizza by opting for wheat crust over white, adding veggies to the toppings and sticking with lean meat toppings. You could even make “Pizza Eggs” by adding marinara sauce, cheese and pepperoni to an omelet and avoid the crust altogether. 1. Preheat the oven to 425 degrees F and adjust an oven rack to the middle position. Spray a 13×9-inch baking dish with olive oil. 2. Use your hands to combine the beef, bread crumbs, pesto, sea salt and black pepper. Roll the mixture into about fifteen 1-inch meatballs. Place the meatballs in the prepared pan and bake in the preheated oven for 15 minutes. 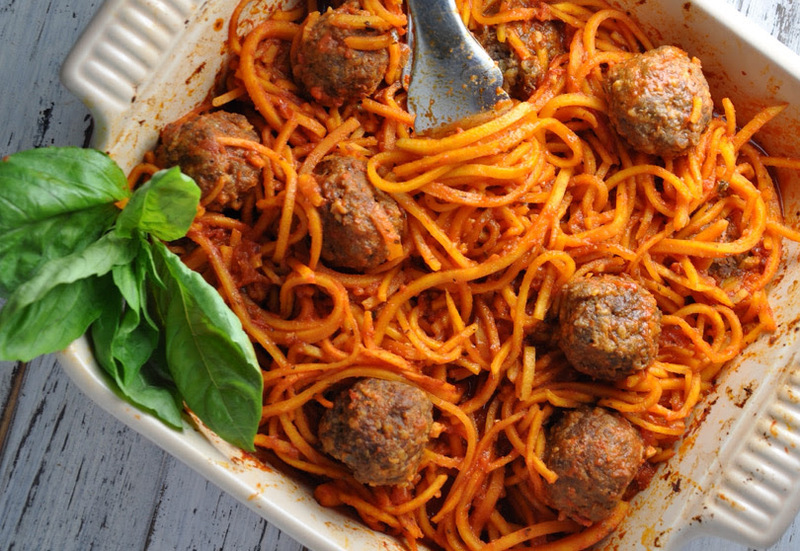 Remove the meatballs, setting aside on a plan, and drain off any liquids from the pan. 3. Spread the noodles in the pan. Pour the marinara sauce over the noodles and toss gently with tongs to coat. Add the meatballs back to the pan, gently nestling throughout the noodles. Cover the pan tightly with aluminum foil and bake for 7 minutes. Remove the foil and bake uncovered for another 3-5 minutes. 4. Remove the pan from oven. Toss to coat the noodles and meatballs with the sauce. Season generously with sea salt and black pepper and garnish with fresh basil.